Pear Therapeutics is the leader in FDA-cleared prescription digital therapeutics. The company’s approach is to integrate clinically-validated software applications with previously approved pharmaceuticals and treatment paradigms to provide better outcomes for patients, smarter engagement and tracking tools for clinicians, and cost-effective solutions for payers. 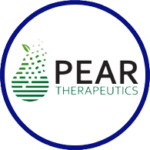 Pear’s lead product, reSET®, is an FDA-cleared 12-week prescription-only therapeutic for Substance Use Disorder (SUD) to be used as an adjunct to standard, outpatient treatment. Pear’s product development pipeline includes reSET-OTM for opioid use disorder (OUD) and additional prescription digital therapeutics in schizophrenia (THRIVETM), combat post-traumatic stress disorder (reCALLTM), general anxiety disorder (reVIVETM), pain, major depressive disorder, and insomnia, for which Pear intends to obtain FDA clearance. For more details, please see www.peartherapeutics.com.